Developer: G-Artists, Sugar and Rockets Inc. Source: Wikipedia, "Intelligent_Qube," available under the CC-BY-SA License. 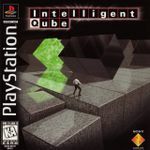 Intelligent Qube is a puzzle game for the PlayStation. It is known as Kurushi in Europe and Australia. In the game, the player controls a character who must run around a platform made of cubes, clearing certain cubes as they approach. Cubes are "cleared" by marking a spot on the stage, waiting for the cube to roll on top of it, and then deactivating the marked spot.